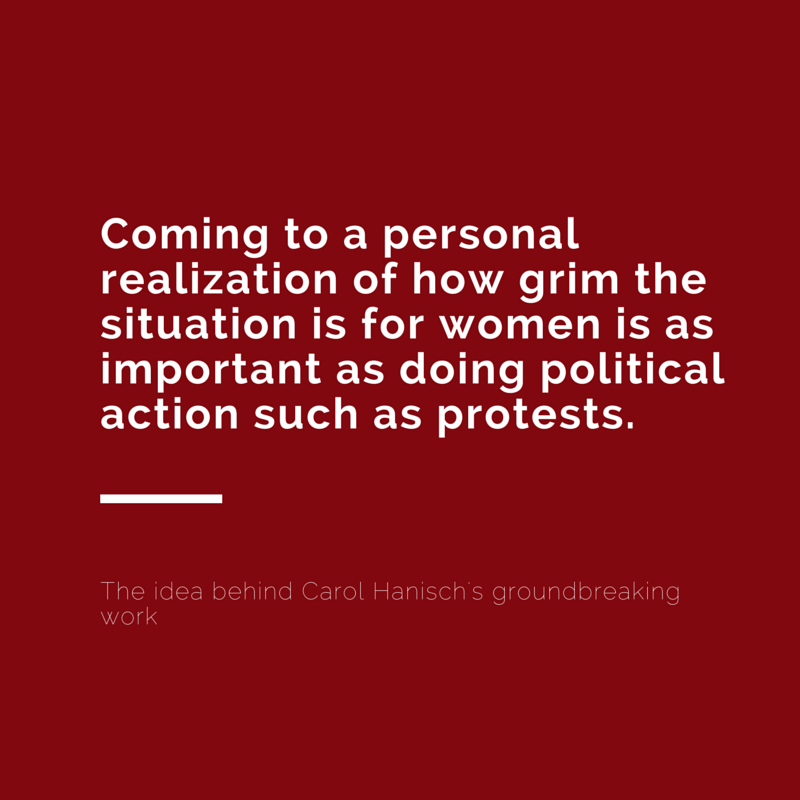 Growing up as a social movement organizer the concept that the personal is political has been knocking about in back of my mind throughout my career, coined by a feminist organizer in a famous 1969 essay with the same title. This simple phrase refers to the theory that women´s personal problems are political problems, which basically means that the life experiences of women are not just about their personal choices, but are the result of systematic oppression. Therefore, when we recognize oppression exists and identify the roots of inequality, we are closer to resolving it. After all, a well defined problem is half the solution. This was a rallying cry during the second wave of feminism in the United States and among student organizing movements that advocated for change within the individual, by changing their mindset to speak up and out and make their personal experiences part of the political narrative. As illustrated in an innovative ad campaign for the Girl Effect, when a girl turns twelve and is in poverty, in the eyes of many she is a woman now. She faces the reality of being married by age 14. Pregnant by the time she’s 15 and if she survives childbirth she might have to sell her body to support her family which puts her at risk for contracting and spreading HIV. More than one million babies die on the first day of life – making the birth day the most dangerous day for babies in nearly every country, rich and poor alike (an additional three million die in the first month). Approximately 120 million children either never make it to school or drop out before their fourth year, 55% of those are girls. Worldwide, more than 51 million girls between the ages of 15 and 19 are taken as child brides (52% of girls are married by age 18 in Yemen), which means 14.2 million girls annually, or 39,000 daily, will marry too young. Women are only 8.1% of Fortune 500 company´s top earners, which is only a two percent increase above what it was five years ago and they hold only 4.8 percent of Fortune 500 CEO positions. Worldwide, women are paid 18% on average less than their male counterparts at work. And although women comprise half the population of the world, currently men make up 78.1% of seats in national parliaments worldwide. When women in the United States talk about a “war on women,” they may be thinking only in the US context, but the war in reality is global. It is easy to look at these statistics and become depressed and therefore demobilized, which is why we need to constantly search for the points of light, and believe me, there are many. When we look at the status of women through the framework of the personal is political, the prism of change becomes more apparent. This perspective is a constant theme in my life and reveals itself in even more meaningful ways working and living abroad. Rather than focusing on the oppression of women, we need to open our eyes to see the opportunities and personal stories of change. Let me introduce you to Fatma. 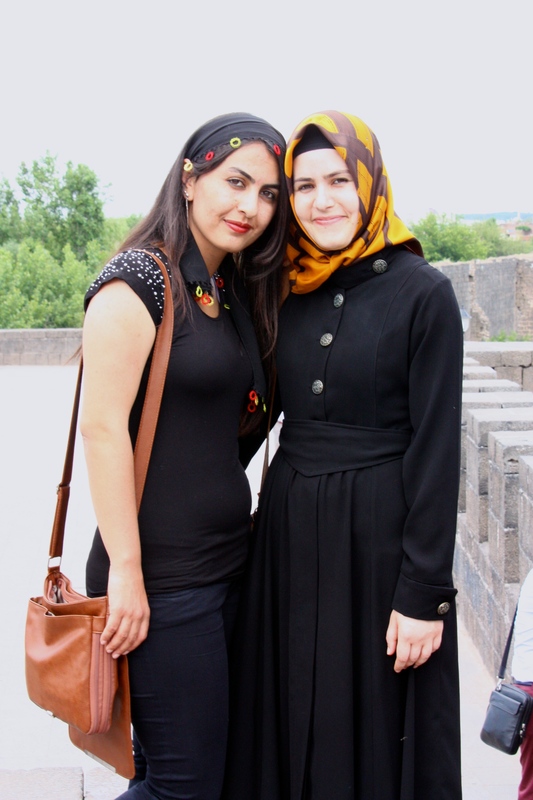 She recently graduated from university in Diyarbakir, in Southeast Turkey where she grew up. She comes from a large Kurdish family (there is no such thing as a small Kurdish family!). She is one of eight children, second to the youngest. Fatma will be a Turkish teacher after she passes the final teaching certificate test this summer. She wants to remain in Southeast Turkey. She is bright, quick witted, thoughtful, beautiful and deeply devoted to her family and her faith. She is pictured here with her friend and roommate, also a fresh college graduate. Fatma only recently decided to wear a hijab. As a Muslim woman of faith this was important to her. This was a personal decision, and hers to make — as she was quick to point out to me when I first met her several years prior in her non-headscarf state. Fatma´s brother had to quit school at age 12 to support the family, later moving by himself to Istanbul at age 16, working his way through the restaurant industry as a runner, waiter, chef, manager and now owner growing up along with the city that has changed as much as he has over the last 15 years. He put her through university and takes great pride in all of her accomplishments. Fatma´s brother is my husband. I talk endlessly about women´s rights and through my work I am constantly looking for the models and mechanisms to increase women´s participation and strengthen their voice in policy and politics. This is quite technical stuff and one can get lost in evaluations of progress, and industry jargon of “best practices” and “lessons learned” and yet another conference call, strategy session, technical support proposal, and so on and so forth. But the personal is political. So, to see my husband and his brothers from a very traditional family put their sister through college and hope and wish the best for her feels like real change. We may not be able to measure it as accurately, but it is a powerful indicator of the shifting family dynamics that give women more opportunity, through education, and by individual choice whether to marry early, whether to wear a headscarf or not. The opportunity of choices, big or small, influences how women see themselves, and importantly, within their cultural reality, express their own desires. Last year I spent time in Afghanistan training political party leaders and activists on voter engagement and outreach. I was aided by a very capable Afghani staff who understood the political dynamics and challenges of working with this particular audience. I got to know one organizer in particular, a 20-year-old who could spin circles around most organizers in the US, male or female. She was smart, energized, passionate, and working as the main household bread winner in her family. The question is whether she will be pressured to marry early or can continue her career. But the personal is political, and as much as I discussed the framework for equality with these nearly all male party activists, I recognized that their own family dynamics have more to do with whether change happens in Afghanistan than any law or new election. Their experience and mindset about gender was being shaped in that classroom, just by the very presence of this steadfast and dedicated young woman who was helping normalize the idea of what women are capable of when given the opportunity to shine. In the development context we need to put more emphasis on watching and supporting evolving family dynamics, and encourage these changes just as fervently as we support adherence to international standards for equality. We also need to do the proper public opinion research to tap into the personal aspects of gender formation, particularly among men, as fathers, brothers, and sons. Men who don´t consider themselves feminists are the potential change agents within all families, whether they are Muslim, Christian, from the West of the far reaches of Central Asia. I suspect that the personal is political will be a theme that continues to show up in much of my work and experiences abroad. I will strive hard to recognize, respect and accept that families can come to their own terms of what gender equality means in their lives, and their children´s lives, and that gently encouraging and standing witness to these changes moves women and girls farther down the pathway toward real progress than any of the bleak statistics on the status of women might indicate. Next Post The Blame Game: Are Women Responsible for their Lack of Representation?